Purpose: To describe a case demonstrating the resolution of active corneal neovascularization, haze and overall adequate physiological function with the fitting of a prosthetic replacement of the ocular surface ecosystem (PROSE) device. Methods: Clinical retrospective case report describing the clinical appearance in compromised keratoconus eyes before and after treatment with PROSE devices. A 51 year old Caucasian male with keratoconus was fitted into PROSE devices after decades of wearing hybrid and rigid gas permeable contact lenses. Observations noted at the entering exam included active corneal neovascularization with associated haze in both eyes that accompanied symptoms consistent with contact lens in tolerance: pain, itchiness, dryness and photophobia with lens wear. He was fitted with customized PROSE devices in both eyesto improve fit, comfort and protect the ocular surface. Adequate fitting endpoints were determined to be haptic alignment in all quadrants, adequate surface area over the haptics to adequately distribute the weight of the vaulting scleral lens adequately (usually this results in the use of a large diameter lens), ruling out suction under the scleral lens and no corneal or limbal touch. No special attention was paid to exactly how much clearance there was centrally - in this case the resulting central clearance was around 400-500 µm. Results: Evaluation over the course of 2 years shows regression of corneal neovascularization and resolution of corneal haze along with improved comfort and resolution of dryness, irritation and photophobic symptoms. Conclusion: PROSE devices were a successful therapeutic option for these corneas that had previously been compromised with active deleterious processes. Despite resulting central clearance being around 400-500 µm, not only were there no adverse effects observed at the cornea/ocular surface, but rather a significant regression in haze and neovascularization was noted over the years. This case highlights that what makes a scleral lens fit physiological is likely more than just the amount of apical clearance or exact amount of post-lens tear layer thickness, but most likely a combination of many factors including lens diameter, limbal clearance, lack of suction, peripheral haptic alignment and tear exchange under the lens. Scleral lens usage has surged in popularity among contact lens fitters in recent years as an option for many ocular conditions . There may be several reasons for this, not the least of which is the potentially profound improvement in vision in irregular corneas  and the management of severe ocular surface disease with the use of scleral lenses [3,4]. With all the potential benefits, as with all other treatments, the risk/benefit ratio must be assessed to determine if the benefits a scleral lens confers outweighs the potential risks introduced. One approach is to determine if the lens is physiologically viable and that no harm is introduced to the ocular environment while it is being worn. Assessment of the ocular surface, which includes the cornea and conjunctiva, before and after using scleral lenses are crucial to determining viability. Current practice commonly involves the scrutiny of lens central clearance or post-lens tear layer thickness, based upon several theoretical studies that correlate lens central clearance to oxygen tension levels and the potential effect this may have on corneal physiology. PROSE (prosthetic replacement of the ocular surface ecosystem) is a treatment developed by BostonSight to restore vision, support healing, reduce symptoms and improve quality of life for patients experiencing complex corneal disease, including irregular corneas and ocular surface disease. PROSE uses Food and Drug Administration- approved custom designed and fabricated prosthetic devices to replace and or support impaired ocular surface system functions that protect and enable vision. The fluid-ventilated gas-permeable (GP) prosthetic devices clear the cornea and immerse the entire ocular surface in a reservoir of preservative free saline solution while the haptics of the device rests entirely on the conjunctiva. Fitting is done diagnostically using a lens trial set. Modifications to subsequent trials are made after evaluating the fit of the initial trial device. This report presents the case of a patient with active ocular surface processes which resolved with the use of PROSE devices. Patient AS is a 51 year old Caucasian male who was referred to our clinic in April 2015 by his ophthalmologist for treatment PROSE consultation. He had a history of keratoconus in both eyes and hybrid contact lens wear for 20 years. There was a period in between when he wore corneal gas permeable lenses, but found them to be too uncomfortable. As a result, he was refit into hybrid lenses and had been wearing them for the last 2 years. He reported ocular discharge upon waking every morning that resulted in difficult lens applications. At the consultation visit, he reported that lens wear was uncomfortable; resulting in eyes that were irritated, itchy, red and photophobic. The discomfort was severe enough that he chose to wear the lenses unilaterally and in an alternating fashion, so that irritations from lens wear affected only one eye at a time. His entering acuities were 20/25 with a hybrid lens OD and 20/400 uncorrected OS. The manifest refraction was -6.50 -6.00 × 085 20/70 OD and -8.50 - 6.00 × 030 20/100 OS. Corneal topography was performed with apical readings of 55.29 D @ 210°, 51.63 D @ 354° OD, 57.76 D @ 290° and 56.80 D @ 181° OS. Anterior segment exam was notable for diffuse conjunctival injection with 360 degree impression staining from hybrid lens OD and diffuse conjunctival injection OS. The cornea was observed to have active neovascularization superiorly with associated haze in both eyes (Figures 1A & 1B). No other complications or complaints were noted or reported by the patient. We proceeded to fit him with BostonSight PROSE devices (Figure 2) using keratometry readings to guide the selection of initial trial devices. Assessment of physiological function included evaluation of corneal clearance and haptic alignment, fluid ventilation, corneal status and subjective tolerance after 1, 3-4 and 6-8 hours of device wear. In particular, careful consideration was paid to corneal, limbal or conjunctival staining after lens removal, rebound conjunctival hyperemia and overall comfort as reported by the patient. No high resolution cross sectional images, such as those obtained from optical coherence tomography, were used to determine the exact relationship of the PROSE devices to the ocular surface in this particular case. Whereas such images may provide additional clinical data, careful observation after 3-4 and 6-8 hours of wear during the treatment period did not show any adverse effects that were clinically significant. It is important to highlight the necessity of thorough evaluation once the lens is removed to determine a physiological fit. Only after lens removal can clinical manifestations such as rebound hyperemia, conjunctival staining to rule out lens impingement, corneal/limbal staining and other key clinical findings be assessed to determine proper physiology. The fit of the PROSE devices was such that there was haptic alignment in the periphery and no conjunctival staining was observed upon removal in either eye. Central clearance of the back surface of the device was estimated relative to the known center thickness of the PROSE device and was noted to be between 350 µm to 400 µm of central clearance OD (Figure 3A), and in excess of 500 µm OS (Figure 3B). He was corrected to 20/15 OD and 20/20 OS with reports of good comfort and wearing times up to 16 hours a day. After the initial fitting process, he was evaluated 1 month later and reported wearing times of 16 hours a day with no discomfort or awareness of the device. Corrected entering acuities were 20/15 OD, 20/20 OS. Photos at this visit compared to those taken at the initial visit showed decreased density of haze particularly in the right eye and the previous active corneal vessels had become ghosted (Figures 4A & 4B). He was subsequently seen annually and at the 2 year mark reported continued comfort and stable vision. Photos at this visit showed a marked difference in both corneas compared to baseline photos and evaluation. Complete resolution of corneal haze was noted as well as inactive, ghosted neovascular corneal vessels in both eyes (Figures 5A & 5B). This case highlights the therapeutic effects of a PROSE device and similarly scleral lenses, in not only correcting vision in an ectatic cornea, but the resolution of active neovascularization and associated haze in corneas that had previously been compromised with hybrid contact lens wear. It also highlights the fact that measures of an adequate fit included determination of tear-exchange under the lens, aligned lens haptics along the conjunctival surface, lack of compression and no corneal or limbal touch in all quadrants. However, no special attention was paid to the exact amount of central clearance or the amount of post-lens tear thickness. High resolution cross sectional images may provide more detailed information, but as noted above, were not used in the fitting of this patient. In the absence of such images careful evaluation of the corneal and conjunctival surfaces are necessary to determine any detrimental effects of the fit. In general, the avascular nature of the cornea is maintained by the active balance of angiogenic and anti-angiogenic factors . Neovascularization or angiogenesis occurs when there is an increase in angiogenic factors that can be initiated by inflammation, infection or other traumatic events such as corneal graft rejection, infectious keratitis or iatrogenic disorders . And while the preceding can involve more complex situations and conditions, contact lens wear is most likely the cause of neovascularization among the general population . In any discussion of scleral lenses being physiologically viable, the role of oxygen tension and hypoxia, lens diameter, tear-exchange, impingement, compression, limbal clearance and suction should all be considered. With regards to hypoxia, it has been demonstrated that decreased oxygen in a closed eye state results in subclinical inflammation resulting in the upregulation of angiogenic factors  that could potentially be mimicked with contact lenses. Corneal gas permeable lenses of sufficient oxygen transmissibility tend to stimulate less angiogenesis than soft contact lenses . This is due to more tear exchange under the gas permeable lens and the coverage of the soft contact lens over the entire cornea, limbus and extra-limbal conjunctiva. Scleral lenses would hypothetically have a similar effect to soft contact lenses because of the complete coverage over the cornea. Previous papers comprised of both theoretical models and clinical studies have attempted to study the relationship between post-lens tear layer thickness, scleral lens central thickness, oxygen tension levels and corneal edema [9-17]. Michaud calculated theoretical oxygen transmissibility levels with different scleral lens center thicknesses and post lens tear layer thicknesses . They concluded that oxygen transmissibility is inversely related to lens center thickness and post lens tear layer thickness. The authors acknowledge that there are no clinical reports to support their theoretical calculations of the potential hypoxic effects on the cornea. Another study conducted by Compan showed that oxygen tension level decreases with thicker central thickness and larger post lens thickness . The authors note that in their model, tear exchange, lateral diffusion or tear mixing were not considered . Giasson measured oxygen tension differences between 200 µm and 400 µm of central vault, though no correlation to corneal edema is noted with decreased oxygen tensions . Vincent and Bergmanson found no clinically significant corneal edema with scleral lens wear [13-15]. Two conflicting findings are from Compan who found corneal thickness measured by pachymetry was 1.59 % with a lower post lens tear film compared to 3.89 % with thicker post lens tear film  and Esen who did not find an increase in corneal thickness in lenses with higher lens central clearance levels . In the clinical setting, case studies have shown that scleral lenses can have a therapeutic effect on compromised corneas. Cressey et al., demonstrated resolution of vascularized limbal keratitis similar to the appearance of the present case . Resolution of recalcitrant persistent epithelial defects have also been observed with PROSE treatment suggesting that there is a beneficial and therapeutic effect conferred onto the ocular surface with PROSE devices or scleral lenses [19-21]. The inconsistencies in the literature and observed clinical outcomes raise several questions regarding the true nature of scleral lenses and the role of hypoxia. Factors that were not considered in the studies correlating central clearance to corneal thickness include the roles of diameter in the overall fit of the lens, suction that can occur with increased wearing time and settling of the lens over time. For instance, Kauffman and Otchere reported on different variables that affect lens settling including diameter and initial central clearance [22,23]. It has also been reported that conjunctival tissue responds to compression variably depending on the location measured . In Alonso’s study, conjunctival thickness changes were measured after scleral lens wear with the greatest change in thickness observed on the superior conjunctiva anterior to the scleral spur next to the limbus with less change posterior to the scleral spur. The lens used was a 16.5 mm mini-scleral and the authors note that larger diameter scleral lenses landing in a different anatomical region will likely result in a different profile of tissue compression. This variability in conjunctival response with different diameters could have implications not only regarding compression, but also factors such as the settling of the lens, the amount of change in central clearance over time and the amount of suction that occurs over time. Clearly our understanding of how a scleral lens affects the ocular surface is at this time limited and there is still a paucity of clinical studies investigating how scleral lenses specifically affect the physiology and anatomy of the ocular surface . One of the challenges to making generalized, wide sweeping statements regarding scleral lenses and physiology is that the term scleral lenses is one broad category that encompasses many lens designs with varying diameters, peripheral curve designs, central clearance recommendations and other parameter differences. Though in theory and viewed in isolation, increased lens central clearance reduces oxygen tension as demonstrated in the studies cited above, it is unclear how this translates clinically or physiologically. It also begs the question of whether or not oxygen tension alone is the best predictor or parameter to assess positive or adverse effects on corneal physiology. Fitting a scleral lens should perhaps be viewed holistically as a system that includes other parameters, all of which are interconnected and play a role on the overall impact of a scleral lens fit on the ocular surface. These include but are not limited to lens center thickness, lens diameter, the effect of suction and the amount of tear-exchange under a lens. One phenomenon of note is the fluid ventilated scleral lens design and concept that was originally conceived by Perry Rosenthal [21,26]. He postulates that certain designs allow for adequate tear exchange under the peripheral haptic allowing for sufficient oxygen supply in the presence of a scleral lens. These designs would inherently impose less suction, which is also a potentially harmful effect that has not been researched or investigated. The case presented herein challenges the notion that having a large amount of lens central clearance or thick post-lens tear layer (~400-500 µm in this case) has an adverse effect on the physiology of the cornea, even when in theory it reduces the amount of oxygen tension. If so, the ocular surface and corneas in this case with baseline neovascularization and haze would presumably have worsened over time. The resolution of neovascularization and haze indicates that the immediate environment provided by a well-adapted, aligned large diameter PROSE device over the cornea was not only not detrimental, but physiologically viable and conducive to healing. In consideration of the above, the fitting of a scleral lens should be viewed as a system composed of many components and parameters that contribute to the overall fit. Given our lack of more concrete knowledge supported by clinical research and studies, effectively managing scleral lens patients should include diligent monitoring of the surface for active signs of inflammation and infection after scleral lens wear. In the present case, the corneas were originally subjected to a sub-optimal physiologic environment with possible hypoxic triggers leading to active neovascularization and associated haze. Refitting into PROSE devices apparently restored ocular surface functions, which resulted in regression and inactivation of the corneal vessels, and a significant decrease in overall corneal haze. As more research enlightens the effect of scleral lens wear on the eye, answers may surface regarding best practices and optimal lens designs. Nau CB, Harthan J, Shorter E, Barr J, Nau A, et al. (2017) Demographic Characteristics and Prescribing Patterns of Scleral Lens Fitters: The SCOPE Study. Eye Contact Lens. Lee JC, Chiu GB, Bach D, Bababeygy SR, Irvine J, et al. (2013) Functional and visual improvement with prosthetic replacement of the ocular surface ecosystem scleral lenses for irregular corneas. Cornea 32: 1540-1543. Schornack MM, Pyle J, Patel SV (2014) Scleral lenses in the management of ocular surface disease. Ophthalmology 121: 1398-1405. Gire A, Kwok A, Marx DP (2013) PROSE treatment for lagophthalmos and exposure keratopathy. Ophthal Plast Reconstr Surg 29: 38-40. Chang JH, Gabison EE, Kato T, Azar DT (2001) Corneal neovascularization. Curr Opin Ophthalmol 12: 242-249. Papas E (2006) Corneal vascularisation and contact lenses. Arch Soc Esp Oftalmol 81: 309-312. Sack RA, Sathe S, Beaton A (2003) Tear turnover and immune and inflammatory processes in the open-eye and closed-eye environments: relationship to extended wear contact lens use. Eye Contact Lens 29: 80-84; S: 192-194. Liesegang TJ (2002) Physiologic changes of the cornea with contact lens wear. CLAO J 28: 12-27. Michaud L, van der Worp E, Brazeau D, Warde R, Giasson CJ (2012) Predicting estimates of oxygen transmissibility for scleral lenses. Cont Lens Anterior Eye 35: 266-271. Compan V, Aguilella-Arzo M, Edrington TB, Weissman BA (2016) Modeling Corneal Oxygen with Scleral Gas Permeable Lens Wear. Optom Vis Sci 93: 1339-1348. Jaynes JM, Edrington TB, Weissman BA (2015) Predicting scleral GP lens entrapped tear layer oxygen tensions. Cont Lens Anterior Eye 38: 44-47. Giasson CJ, Morency J, Melillo M, Michaud L (2017) Oxygen Tension Beneath Scleral Lenses of Different Clearances. Optom Vis Sci 94: 466-475. Vincent SJ, Alonso-Caneiro D, Collins MJ (2014) Corneal changes following short-term miniscleral contact lens wear. Cont Lens Anterior Eye 37: 461-468. Vincent SJ, Alonso-caneiro D, Collins MJ, Beanland A, Lam L, et al. (2016) Hypoxic Corneal Changes following Eight Hours of Scleral Contact Lens Wear. Optom Vis Sci 93: 293-299. Bergmanson JP, Ezekiel DF, van der Worp E (2015) Scleral contact lenses and hypoxia: Theory versus practice. Cont Lens Anterior Eye 38: 145-147. Compan V, Oliveira C, Aguilella-Arzo M, Molla S, Peixoto-de-Matos SC, et al. (2014) Oxygen diffusion and edema with modern scleral rigid gas permeable contact lenses. Invest Ophthalmol Vis Sci 55: 6421-6429. Esen F, Toker E (2017) Influence of Apical Clearance on Mini-Scleral Lens Settling, Clinical Performance, and Corneal Thickness Changes. Eye Contact Lens 43: 230-235. Cressey A, Jacobs DS, Carrasquillo KG (2012) Management of vascularized limbal keratitis with prosthetic replacement of the ocular surface system. Eye Contact Lens 38: 137-140. Ciralsky JB, Chapman KO, Rosenblatt MI, Sood P, Fernandez AG, et al. (2015) Treatment of Refractory Persistent Corneal Epithelial Defects: A Standardized Approach Using Continuous Wear PROSE Therapy. Ocul Immunol Inflamm 23: 219-224. Lim P, Ridges R, Jacobs DS, Rosenthal P (2013) Treatment of persistent corneal epithelial defect with overnight wear of a prosthetic device for the ocular surface. Am J Ophthalmol 156: 1095-1101. Rosenthal P, Cotter JM, Baum J (2000) Treatment of persistent corneal epithelial defect with extended wear of a fluid-ventilated gas-permeable scleral contact lens. Am J Ophthalmol 130: 33-41. Kauffman MJ, Gilmartin CA, Bennett ES, Bassi CJ (2014) A comparison of the short-term settling of three scleral lens designs. Optom Vis Sci 91: 1462-1466. Otchere H, Jones LW, Sorbara L (2017) Effect of Time on Scleral Lens Settling and Change in Corneal Clearance. Optom Vis Sci 94: 908-913. Alonso-Caneiro D, Vincent SJ, Collins MJ (2015) Morphological changes in the conjunctiva, episclera and sclera following short-term miniscleral contact lens wear in rigid lens neophytes. Cont Lens Anterior Eye 39: 53-61. Schornack MM (2015) Scleral lenses: a literature review. Eye Contact Lens 41: 3-11. 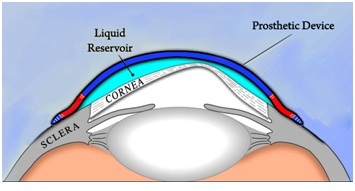 Rosenthal P, Croteau A (2005) Fluid-ventilated, gas-permeable scleral contact lens is an effective option for managing severe ocular surface disease and many corneal disorders that would otherwise require penetrating keratoplasty. Eye Contact Lens 31: 130-134. Figure 1: A) Baseline corneal neovascularization and haze superior temporal, right eye, B) Baseline corneal neovascularization and haze superiorly, encroaching visual axis, left eye. Figure 2: Schematic of a PROSE device. Figure 3: Resulting lens central clearance A) ~350-400 µm, right eye, B) ~≥500 µm, left eye. Figure 4: Corneal appearance after 2 months of PROSE device wear in the right eye (A) and left eye (B), showing signs of remodeling and improvement at the ocular surface. Figure 5: Corneal appearance after 2 years of PROSE device wear in the right eye (A) and left eye (B), showing signs of complete regression in neovascularization and clearing of corneal haze. Citation: Kwok A, Carrasquillo KG (2018) What Makes a Scleral Lens Fit Physiological? A Case Report. J Ophthalmic Clin Res 5: 41.